A bumper crowd of 3,817 enjoyed England Under-20s’ 2-1 win over Italy at AFC Fylde’s Mill Farm home on Thursday night. 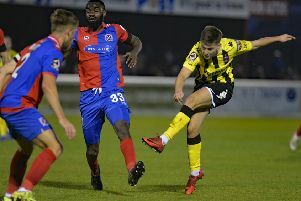 First-half goals by Arsenal pair Edward Nketiah and Joe Willcock clinched victory for Paul Simpson’s side in the Elite League encounter. An England team captained by Bristol City’s Lloyd Kelly settled the quicker and went close to taking the lead after only three minutes, when Leeds full-back Tom Pearce’s 25-yard free-kick was tipped on to the bar. The hosts did hit the front on 18 minutes, when Nketiah beat his man and drilled a low shot into the bottom corner. The lead was doubled before half-time, when Willock despatched a penalty awarded for shirt-pulling. England went close to third when Nketiah shot just wide after a fine run but the Italians came back strongly. David Frattesi pulled one back with a near post header from Alessandro Buongiorno’s cross 10 minutes from time. And as Italy threatened an equaliser, Bournemouth keeper Aaron Ramsdale pulled off a fine save in a goalmouth scramble. England held on for the three points which leave them top of the Elite League going into Sunday’s fixture away to the Czech Republic. England manager Simpson said: “I’m delighted with the performance. We knew tt was going to be really tough because they are a strong side. Both sides showed great concern when a young ball boy was struck in the face by the ball and needed treatment. He quickly recovered, watched the rest of the game and was presented with an England kit. England team: Ramsdale, James, Pearce, Field, Suliman, Kelly, Eze, Tavernier, Nketiah, Willcock, Embleton; subs: Edwards, Trott, Hurst, Wilmot, Vieira, Dozzell, Austin.